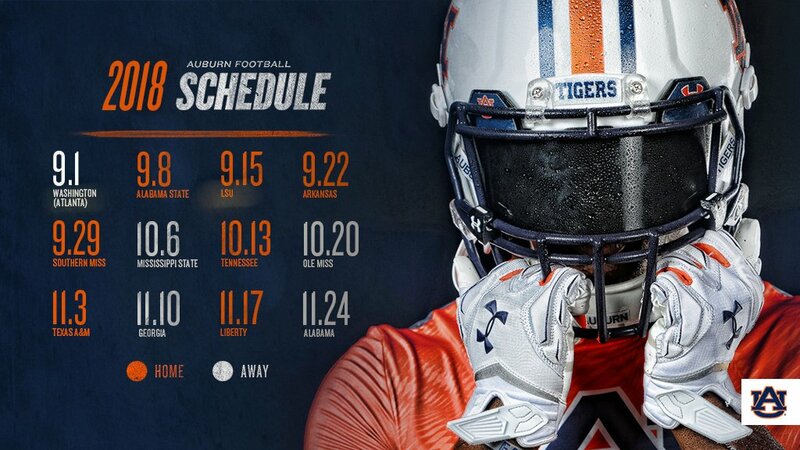 Auburn just sneakily released their 2018 football schedule via Twitter. The past few years, the SEC Network has had a show where they released all 14 SEC teams’ schedules, but apparently that’s gone. Or maybe Auburn is jumping the gun. We knew pretty much all of this, but not the dates, so let’s take a quick look. -Auburn will get back in the Chick-fil-a game with what will still be a pretty good Washington team. Gotta love these off-campus big games that don’t feel like football, but it’s big for the program. -Alabama State comes up the road the following week. Hopefully Auburn won’t fumble 5 times and keep it close. -I see we’re getting back to that early LSU game in Auburn again. Not sure if Ed Orgeron will still be there. -Arkansas comes to the Plains for the 3rd straight home game for the Tigers. Bert probably won’t be with them. -Bret Favre’s Southern Miss Golden Eagles makes it four home games in a row for Auburn. Fortunately, he’s not suiting up. -After a cowbell-clanging trip to Starkville, Auburn hosts Tennessee for the first time since 2008. The Tigers will be going for 7 straight wins in the series, and Butch most definitely will not be there. -On the road again to Ole Miss, who will be led by another new head coach in the SEC. -After a week off, the Aggies come to Auburn for hopefully their first loss on the Plains. And again, they will probably be without their current coach. -The dumb continues as Auburn has to travel to Georgia and Alabama, but they have the upstart Liberty Flames with Turner Gill leading them. Psst… they beat Baylor this year. -Auburn has ZERO back-to-back road games. The longest/toughest SEC stretch is October 16 to November 3 with Mississippi State, Tennessee, Ole Miss, and Texas A&M. I’m not saying Auburn is winning the National Championship next year, but Auburn is winning the National Championship next year. Other than the stupidity of the Georgia and Alabama both on the road, that we need to fix now, this is a very, very favorable schedule. Oh, and can we get more than one October game in Jordan-Hare, please? Come on, SEC. But really, thank you.